Amanda is checking out Botswana and Victoria Falls. When she returns I would love to have an African evening where we discuss some of the differences between Southern and East Africa as this is one of the most common questions we get asked when people are planning a vacation to Africa. With our focus being Africa we have ensured that our specialists have personal experience of lodges and hotels in South Africa, Zimbabwe, Botswana and Tanzania. Kenya still on the to do list! I just wanted to share Amanda’s latest post from her blog – this is something to think about for your next trip to Africa. This is a biting question! Mosquitoes are strange creatures. It seems that there are different varieties all over the world with very different patterns of behaviour. Now you would think that they would be worse in hot tropical locations – but that is not my experience. I grew up in South Africa and of course mosquitoes are very common there. But .. we were only bothered by them at night. So all the houses in South Africa had mosquito netting on the windows and every night as the sun starting going down you prepared yourself for the evening. My Dad used to call it Mozzy Time! He would go around the house closing windows and making sure those pests couldn’t get inside. Thing is he was just neurotic about anything that flew or crawled. The mosquitoes were not a problem at all. The drill was if you are sitting outside just spray some Peaceful Sleep on your exposed arms and legs and you are done! We entertained outside on the verandah with no problem at all. 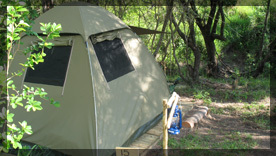 We also did a lot of camping and again the same precautions would come into play. Even the little ones would play outside well into the night with minimal problems. Of course there were the odd mozzy bites which were a nuisance but for the most part it was no big deal. One camping weekend trip I realized that I had left the tent at home. No problem – we used the jib from our sailing dinghy and erected a temporary shelter – slept on the grass under the stars. With the help of the ever handy Peaceful Sleep we had an undisturbed night (except for when a huge monitor lizard scrabbled through the grass next to us on his nocturnal jaunt). So when we decided to emigrate to Canada I thought well, I can deal with the snow and the cold and at least there won’t be any mosquitoes. WHAT? Was I ever wrong. My goodness me. Where do these creatures come from? First of all they are massive compared to our little African fellows. They are also slow. Our African chaps zip around so quickly it would be hard to swat one and they are difficult to see in any event. These Canadian mozzies seem to be in slow motion in comparison. They also have no decent sense of time. Any self-respecting mosquito would realise that you don’t hang out during the day looking for a blood snack. Rest up during the day and then come out when the sun goes down. That’s the procedure. Didn’t they read the manual? Even the web site of the Salisbury Morse Place School states: “Winnipeg is [incorrectly] known the “Mosquito” capital of Canada. 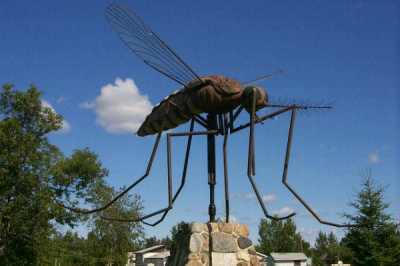 The mosquito is jokingly considered Manitoba’s provincial bird!! !” In reality the capital designation rightly belong to Komarno, Manitoba, about 70 km north of Winnipeg. In fact the name Komarno is Ukrainian for mosquito. There is a 4.6 meter statue of a mosquito, built in 1984 in Komarno. Apparently the town is now saving up for a big bug zapper. First of all I am a coward. Just doing a guided bike ride in Amsterdam had me quivering with fear but determined, nonetheless, to do this or regret it forever. It worked out fine. I wobbled a lot, concentrated so hard I was exhausted at the end, but I did it and I felt great about it. A recent trip to Costa Rica brought more challenges as the group had signed up for a zip lining excursion. Oh I had the option to cop-out and go and do a sedate boat cruise on the river but … wow …. ziplining! How many times had I seen youtube clips friends had posted to facebook? How many selfies can you take on a zipline? How many times would I see this featured on BBC Travel Channel? No – I had to do it. It was only on the bus ride there that my first misgivings started to fidget around my heart, clustering together and setting up a nest there, raising my pulse slightly and making me second guess myself. Then the guide came around with the forms – you know the ones where you totally forgive everyone on the planet if you should happen to slip and plunge to your death. Yes, those ones. OMG – I hate making a scene and I was afterall on the bus and committed. So I signed the forms and started to think happy thoughts. Finally we arrived at the base where we were given a talk on how to wear the equipment and what to do and how to zip. All well and good. They were all lovely people and very knowledgeable and the equipment looked top class. Oh yeah – I am totally going to cream through this. Right – off we go. To the first platform where we climbed up and clipped on. One by one getting to the edge. No going back now Lesley. Don’t close your eyes idiot – that’s the whole point of being there. I took a leap of faith – literally – and jumped off. Oh Wow – adrenaline overload – never saw a thing. Got to the next platform. Deep breath. Thinks to self – Yeah girl – you rock! Now imagine if I hadn’t done that. How disappointed I would have been with myself. My fear seems to be of killing myself or at least hurting myself badly. Others however have other fears. The fear of spiders – this is very real. There are courses you can go on to get you over this particular fear. 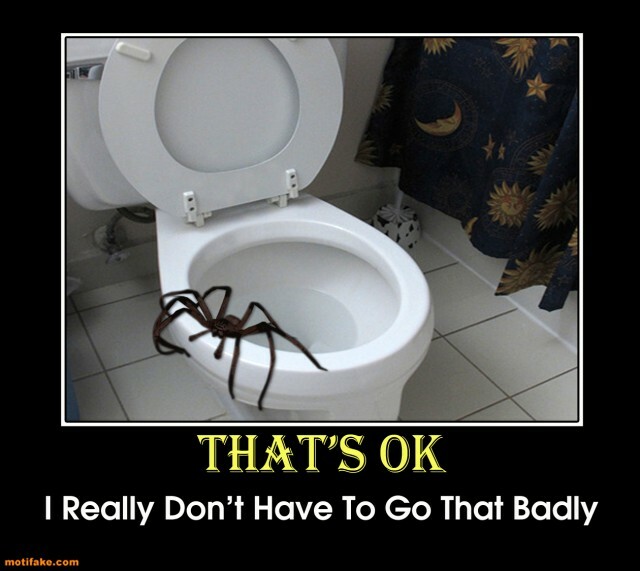 Now myself – I am not really scared of spiders. Yes of course growing up we would all scream when there was a spider in the house and jump on the nearest piece of furniture and the only person able to save us was my mother. (Yeah my dad was on the furniture with us too!) When I moved to Africa, however, it was a case of either get over it – or get over it! My first scary experience was deep in the Transkei province of South Africa. We were driving to Umgnazi River Bungalows and the only way there was on a dirt road. As we travelled and travelled I began to realise how remote this place was. We arrived at the Bungalows late at night – our accommodation being what they call a rondavel. A round building with a thatched roof. There was no electricity – the generator went off at 10 pm – and there were spiders and geckos everywhere. What was worse was that you couldn’t see them on the thatched ceiling so of course my imagination doubled their size and tripled their numbers. I spent a sleepless night with a torch in my hand intermittently checking the ceiling and no doubt giving the geckos a sleepless night too! Every experience makes us grow and (after a long while) I went from this to sleeping out in the open under a tarp when we had forgotten our tent. We were on the banks of a crocodile infested lake with leguaan (rock monitor) lizards rustling past us in the grasses and goodness knows what else. I slept like a log although I did wake up in the morning covered in bites of some sort. So next time you travel and you are faced with a challenge think about how amazing you are going to feel about yourself the next day – even if at the moment you think that you are going to throw up! It’s worth it – honestly! All creatures great and small…. When you contemplate a trip to Africa – especially East Africa – you think about the Big Five – the Lion, the Leopard, the Elephant, the Rhino and the Buffalo and of course I was thrilled to spot these on my recent trip to Tanzania – all except the elusive leopard. Our guide however opened up a whole new world of “game spotting” to us in the most unexpected way. We spent a fascinating twenty minutes watching a dung beetle rolling and pushing its dung ball round and round. Periodically he would climb on top of the ball just to check out the terrain. Who is the dung beetle’s enemy? Well birds for one as well as bats, reptiles and other insect eaters who would just love a juicy dung beetle – a bit like us during lobster season on the East Coast. And what about the safari ants? We have all had ants in the house and what a nuisance they can be. We stopped and watched columns of ants – thousands and thousands of them – marching across the road. You have heard the story about elephants being afraid of mice – well it is actually these safari ants they are really afraid of. They can climb up an elephant’s trunk and hang on with their pincers and there is nothing the poor elephant can do to shake it out. Our guide had seen elephants bashing their trunks up against tree trunks in an attempt to get rid of this pesky intruder. They are so scared of ants that they can smell them and avoid them like the plague and as always in Africa there is a way to make nature work for everyone. Local villagers who farm water melons have a terrible time with the ellies who just love the sweet taste of watermelon and when you bear in mind that elephants consume between 400 and 600 pounds of vegetation a day. That’s a lot of watermelons. The villagers know the elephants hate the ants so a few bags of sugar sprinkled around the field attract the ants and voila! You have an instance elephant proof security fence! The best small thing about Tanzania – the children! Our visit to a local kindergarten was heart warming and entertaining. Would you like bugs with that? Bugs can be a deal-breaker. Just as you have that tropical package all sewn up and ready to go THAT question jumps up. “Er, do you think there will be bugs there?”. Well, it’s Costa Rica. Pretty good chance of there being bugs. Same thing in Belize, or Mexico or Africa. Bugs kinda like hanging out in hot tropical humid destinations. 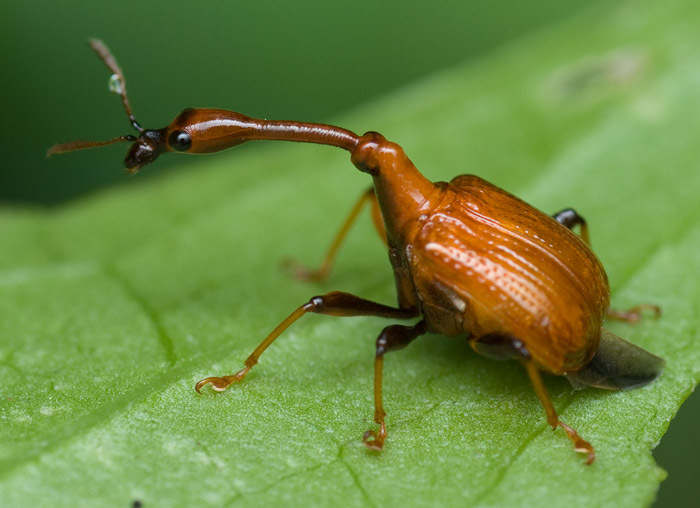 What is it about bugs that most of us don’t like? Is it because they are small or that they scuttle (shudder) or just that they look so strange? Maybe it is because we don’t like the idea of them creeping up on us and looking for one of those warm humid places they like so much! When you see them in the jungle that’s no so bad. After all that is their natural habitat. But when you see them in your natural habitat – well that’s just freaky. I once had people come back from Anaheim telling me how their vacation was totally ruined because the room was full of bugs. Upon examination it turned out that the bugs were actually ants – and I agree that is annoying. When I asked if they had advised the management they said they sorted it out themselves by plugging up the ant holes with toothpaste….. mmmm – novel approach. I wonder if the mint in the toothpaste made the ants’ eyes water. And I must admit having been guilty of bug-fear too (before I was cured that is). I spent an entire two nights at Umgazi River Bungalows on the Transkei Coast in South Africa just petrified of falling asleep in case one of the geckos on the thatch ceiling fell on me. I learnt very quickly that you can get used to anything in time. It’s so tiring being scared all the time, really! And ignorance is bliss – young children haven’t learnt to be scared yet but copy our reactions. 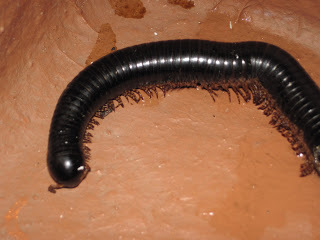 So when I found my young son sitting on the doorstep in Africa with the remains of a huge millipede scattered over his bib I just had to merrily say “Oh dear – what have you been up to?” while I got rid of the debris. 2.14 am …….I can’t believe I am camping out in a small two man tent in the middle of the African bush and there isn’t even a fence between us and them … the predators. How did I talk myself into this? Even more curious… how did I talk my sister into this. She hates spiders and creepy crawlies so much that she sprayed our tent with DDT and now we can hardly breathe. 2.35 am ….. Holy cow! What is that noise? Sounds like hyenas. Oh… there goes the garbage can. They must have found the leftovers from the barbecue. Ugh, I hate hyenas – I know that sounds irrational but they look so primitive and evil. 3.05 am….. Hell’s teeth. What’s that shouting. It sounds like Peter. He’s in the other tent with the kids. What should I do? He’s banging on the side of the tent and shouting “Voetsak” (get away in Afrikaans). Is someone trying to break in. How do you break into a tent anyway? Shouldn’t I rush over there and save my babies….. mmmmmm …. where’s that Tiger Mom in me? Oh yeah – we’re in Africa, not India. So where is the Lion Mom in me? Hang on a minute. It’s gone quiet again. He must have scared them away. I’ll be brave and stick my head out of the tent and shout over to him. zzzzzzzip zzzzzip – “Are you ok Pete?” “Yes, go back to sleep”. Sleep? Who is he kidding? 3.15 am ….. so what happened to the Ranger. He said he was going to take the rifle with him and if we needed anything in the night just shout. He must be as deaf as a post. Shame such a young man too! Just hope we don’t get a herd of marauding elephant through here. 3.45 am …… I wonder how Trish manages to sleep with her hat on. She’s had it on all night. Says it keeps the spiders from falling on her head. Yawn…. 4.15 am….. Oh how lovely – an owl in the tree over us hooting away. At least it will keep us company. 4.50 am ….. Wish I had the rifle. I would shoot that bloody owl. I’m homesick. That’s weird … because I am home. Canada is my home now. So why am I homesick and for where? I was born in England ……. nah…… not homesick for England. I grew up in South Africa – and that’s the problem. I have this sudden longing for the bush. They say you can take the girl out of the bush but you can’t take the bush out of the girl. There’s something healing about being out in the African bush – and yet it can be a harsh place. Nature rules and there are the hunters and the hunted, the victors and the victims. To see a lioness stalking her prey is thrilling and yet some part of you always wants the poor antelope or zebra to get away. Run! Run! You feel like shouting as the poor buck zig zags across the veldt in panic. The lioness is clever, fast and strong and the antelope seldom wins. 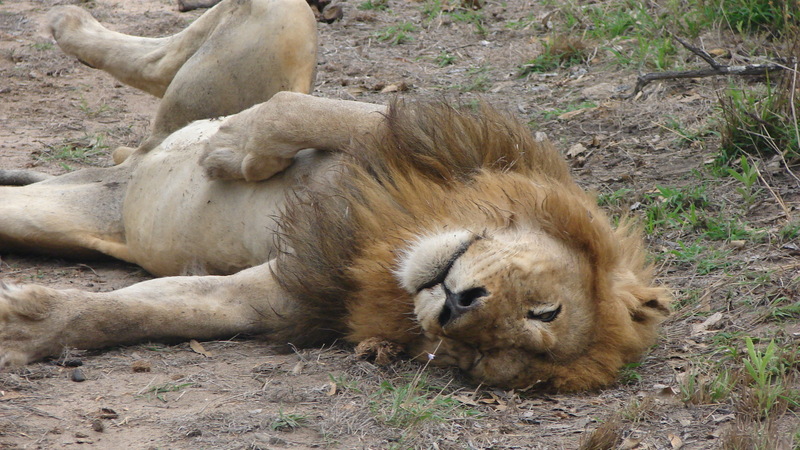 On my last trip to the bush in Sabi Sands Game Reserve we came across a huge pride of lion after the kill. The huge black-maned male could barely move he was so full. He lay with his belly distended, his paws flopping in the air, right in the middle of the track, dozing in the midday sun. His pride lay around him licking and cleaning and grooming and you could still see the traces of blood on their whiskers and chins. It was a hot day and our ranger knew that they would not move for hours but they would be thirsty later on. We would return after sunset. Sure enough once the sun had gone down and that strangely fast coldness had descended on the bush we found the pride again – this time stirring from their slumber. As if in answer to an unspoken signal they slowly made their way to their feet and one by one ambled off down the track. Our ranger told us there was a water hole some way in the distance and we followed in the landrover with the large floodlight on the front. The light did not seem to bother them. From time to time one of them would stop and turn back, gazing at us, eyes lighting up in the headlamps of the vehicle. More curious than threatening. Finally they reached the water-hole. 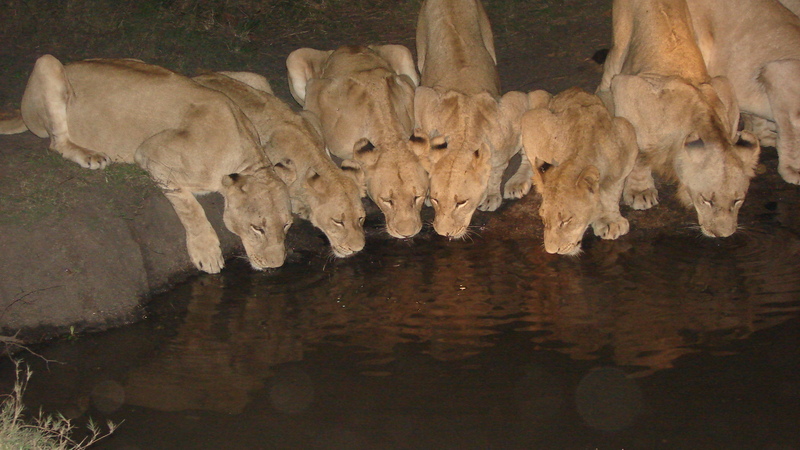 All the females lined up – like a Radio City chorus line – along the edge of the waterhole. With beautiful symmetry they hunched down on their powerful forequarters and daintily lapped up gallons and gallons of water. We sat in the landrover – speaking in whispers – thrilled and awed by Nature’s beauty. Oh yes – I AM homesick for the bush.